The states of north-west India may be treated as a "national laboratory" to track the path of agricultural growth in the country. Evolving a few strategies can facilitate growth. Punjab and Haryana being agricultural advanced states have requirements of agricultural sector different from other states. For instance, some of the schemes like National Food Security Mission are less relevant to these states. The states should have flexibility in the utilisation of such funds keeping in view the local requirements. Climate change and variability are also posing threat to food and livelihood security. Higher agricultural education needs to be brought under a regultsory body to ensure competence and quality that will contribute to the growth of agriculture. A Groundwater Conservation Fund may be created, which should be allocated to such states which contribute for the national food security cause at the expense of their natural resources. Agricultural growth was made possible by development and adoption of new technologies, higher public investments in agriculture and other policies. Agriculture NSDP of some states like Chhattisgarh, Jharkhand, Rajasthan and Madhya Pradesh grew by more than 5per cent per annum. The rate of growth was 1.49 per cent in Punjab, 1.95 per cent in Uttarakhand, 2.33 per cent in Uttar Pradesh and 0.1per cent in Himachal Pradesh during this period. The agriculture sector in North-west India in general and Punjab state in particular is now facing economic and environmental stresses. This is in the form of higher increase in the cost of production relative to output prices due to high level of inputs use and sharp increase in input prices, falling profitability in farming, reduction in employment in the agriculture sector, increased incidence of landlessness and indebtedness among the farmers. There is fall in the ground water table, mining of soil nutrients with emerging deficiency of micro-nutrients and higher incidence of insect-pests/diseases on crops. Climate change and variability are also posing threat to food and livelihood security. Recent weather aberrations have caused increased use of inputs and isolated crop damage resulting into rise in cost of production, lower production, greater pressure on groundwater resources and more risk of pests and diseases. To address these challenges, following strategies are suggested, which needs attention in the upcoming Union Budget. Emphasis on agricultural research & education: Technological developments are essential for faster growth of agriculture. During the 11th Plan period (2007-12), the agriculture sector grew annually at the rate of 4.06 per cent, and this growth needs to be sustained over time to improve the standard of living of the farming community and ensuring national food and nutritional security. Increased public spending on irrigation, rural infrastructure along with technologies generation and dissemination was one of the important drivers of this growth process. Thus, higher allocation for agriculture research and education is required in the coming years to provide further impetus to agricultural growth. This has become necessary due to greater climate variability in recent years. It demands extensive experimentation in crop improvement as well as production and protection technologies in order to address the challenge of associated abiotic and biotic stresses. Farmers also need to be provided with improved seeds of various crops at cheaper rates through greater emphasis on varietal development programmes. This is true especially in those crops where public sector agricultural institutions' presence has declined and farmers have to pay high prices for seeds. The allocation to agricultural research, extension and education needs to be raised from the current level of around 0.8 per cent of agriculture GDP to at least 1 per cent. In recent years, we have seen mushrooming of universities and colleges imparting higher education in agriculture. Even some have started agricultural education programmes under distance learning mode. Most of these institutions lack infrastructure and human resources producing low quality agriculture graduates and postgraduates. Unfortunately, higher education in agriculture sciences is not regulated under any regulatory mechanism unlike medical, veterinary and engineering sciences. Therefore, higher agricultural education needs to be brought under a regulatory body to ensure quality and competence contributing to the growth of agriculture sector in the long run. Further, such colleges and institutes that offer degrees in agricultural sciences should be affiliated with agricultural universities so that uniformity in the course curriculum is maintained and quality instruction is assured. Integrated farming system approach in higher education in agri-sciences: Phenomenon of bi/trifurcation of agricultural universities have been seen in many states by creating independent horticulture, veterinary or forestry universities defying the concept of Integrated Farming System, which is the soul of agriculture/farming sector of the country due to the predominance of small holders. The viability of small holders can only be ensured through promoting/adoption of integrated farming systems encompassing field and horticultural crops, animal husbandry, forestry, fishery, etc. If required, regional research stations or sub-campuses may be opened keeping in view the regional importance of different sub-sectors. Farmers are overusing water and mining soil nutrients for higher productivity and production. In the absence of any economic incentives, they are less inclined to adopt water and nutrient-efficient technologies and practices leading to their un-sustainable use. Adoption of such technologies needs to be upscaled by providing subsidies on them. 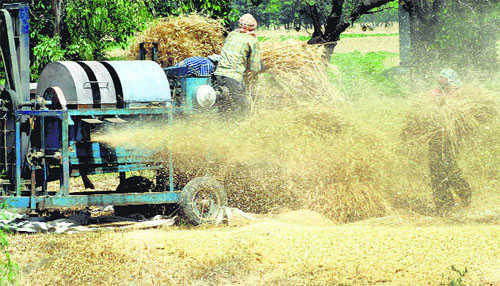 Crop residue management is another major concern in North-west India. Management of paddy straw is a serious challenge, machinery for which is costly and needs to be subsidised to promote its use. Punjab and Haryana have virtually mined water and exported to other states in the form of grains. These states, therefore, deserve to be financially compensated for this, so that they could design and implement some measures for recharging water and developing and promoting modern techniques for higher water use efficiency. A Groundwater Conservation Fund may be created, which should be allocated to such states which contribute for national food security cause at the expense of their natural resources. Punjab and Haryana are required to take the problem of monoculture of paddy-wheat rotation and unsustainability of natural resources head on. The problem is serious and complex. Maize, cotton, mung bean, arhar, groundnut, barley, chickpea, fruits, vegetables, agro-forestry, etc. have the potential to emerge as alternatives to paddy and wheat crops, if supported in market development, value addition and their other infrastructure requirements. Raising relative profitability of these alternatives and their assured marketing can promote crop diversification in the region. Funding for crop diversification needs to be further enhanced for research and development purposes under mission mode in the long run for national interests. It should be kept in mind that North-west India fell into the trap of paddy-wheat cropping system as a result of national policies on output prices, procurement and promoting intensive use of inputs to meet national food security. The scope of value addition is high in marketable surplus regions for crop diversification and sustaining future growth. For this, the agro-industries should be provided with economic incentive to set up their base in such states (as was done for hilly states). Two mega food parks have already been sanctioned for Punjab and more such parks are needed to further strengthen the scope of value addition and processing. Quality-testing/ certification labs: Quality testing labs for different agricultural commodities have assumed greater significance in recent years due to expanding export markets (for example, for the export of Basmati rice and vegetables from North-west India to Middle-East countries and Europe), where quality of the products is monitored and adhered to very strictly. Strengthening of such facilities in different regions of the country is thus important due to spatial differentials in quality among different crop species. India faces the peculiar problem of a high rate of unemployment on the one hand and mismatch between available human resources and skill requirements of the industry on the other. Many empirical studies have shown that our education is not able to impart skills required for employability. The problem is more severe in rural areas. Therefore, skill-development centres in various trades need to be opened in large numbers in rural areas or in semi-urban areas which are easily accessible to rural youth, so that this rural workforce is able to get employment in industry or service sectors as well as may start their own small ventures. A fundamental change in the structure of education needs to be required. There should be two pathways after schooling. The intelligent students should move to the educational institutions of higher learning (universities and colleges), whereas other students go to skill-development centres to acquire skills that are required by the industry and services sector. The plans about agricultural sector are formulated at the national level but ground realities at the grass-root level vary from state to state due to very large diversity in the agro-climatic conditions of different states. The challenges of agriculture in North-west India, especially in Punjab and Haryana states cannot be viewed in isolation. Other irrigated regions on the path of intensive agriculture are also going to face similar problems of economic squeeze and environmental stresses in future. Therefore, the agriculture growth path in these states may be treated as a "national laboratory" for the development of technologies and strategies for sustainable agriculture and the states should be financially accommodated to come out of this situation. North-west India, especially Punjab state which stands at higher level of productivity in agriculture, expectedly grew at a lower rate. Punjab from a mere 1.53 per cent geographical area of India produces 18.4 per cent of wheat and 10.6 per cent of rice production of the country (2013-14). The productivity of wheat rose from 1.1 ton/ha during 1960-61 to 5 ton/ha during 2013-14 and that of paddy (non-basmati) from 1.6 ton/ha to more than 6.0 ton/ha over the same period. Additionally, the state now produces 7 per cent milk, 37 per cent honey and 40 per cent mushrooms of the country.